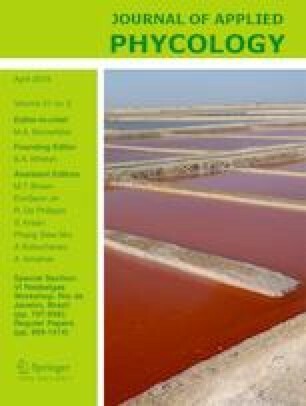 Sulfated polysaccharides (fucoidan) of the sargassacean brown seaweed Nizamuddinia zanardinii were isolated using different methods to evaluate the effects of extraction techniques on their chemical compositions, molecular characteristics, anticancer, and immunomodulatory activities. The polysaccharide extractions were carried out using hot water, carbohydrase, and protease enzymes including Alcalase, Flavourzyme, Celluclast, and Viscozyme. Results showed that the yield of fucoidan varied from 4.28 to 5.58% in different extraction methods. Alcalase exhibited the highest extraction efficiency of fucoidan compared to the other extraction methods. Fucoidans were composed of different levels of carbohydrates (30.83–40.27%), proteins (18.72–23.75%), sulfates (12.92–20.05%), and uronic acids (5.73–22.08%). All extracted fucoidans were composed of fucose, galactose, glucose, mannose, and xylose with different molar percentages depending on the extraction methods. The weight average molecular weight of fucoidans varied between 107.9 and 181.1 × 103 g mol−1. The FTIR spectroscopy confirmed the presence of sulfate esters by bending vibration of C–O–S and stretching vibration of S=O peaks at 818 and 1250 cm−1, respectively. Fucoidans showed the anticancer activity ranging from 26.77 to 67.46% for HeLa cells and 21.31 to 55.94% for Hep-G2 cells. All polysaccharides significantly stimulated RAW264.7 macrophage cells to release nitric oxide among which polysaccharides extracted with the assistance of Alcalase exerted higher immunostimulatory activity. These results indicated that the employment of Alcalase in the extraction of fucoidan produced polysaccharide with higher sulfate content and molecular weight resulting greater biological activities.